Artman's laptop screen has a 1920 x 1200 resolution, which makes the text too small and hard to read. He asked the Windows forum for help. Artman's laptop screen has a 1920 x 1200 resolution, which makes the text too small and hard to read. He asked the Windows forum for help. The obvious answer is to lower the screen resolution in Windows, and back in the days of CRT monitors, that was also the correct answer. But LCD monitors have a fixed, physical resolution, generally referred to as the native resolution. They can only display lower resolutions by upconverting the image, adding pixels to make for instance, a 1680x1050 graphic fill a 1920x1200 screen. This inevitably distorts and blurs the image. The one on the left, with an 8x8 resolution, has a red box that takes up exactly 1/4 the height and width of the screen. But when the resolution is upconverted to 10x10, those dimensions become impossible to achieve. The red box has to be either too big or too small. Although varying the colours around the edges can make the difference less obvious, the result is inevitably a compromise. Of course, these distortions will be far less extreme with a 1920x1200 screen than a 10x10 one. A better solution is to change Windows' Dots Per Inch (DPI) setting. The more pixels Windows uses to draw an inch, or to draw ten-point type, the larger text and objects will appear on screen. Windows 7: Click Start and type display. Click the Display option that appears directly below the "Control Panel" subheading. Select the option of your choice. Vista: Click Start, type personalisation, select Personalisation (you probably won't have to type more than "person"). Click Adjust font size (DPI) in the left pane. Select the 120 DPI option for a 25-percent increase, or click the Custom DPI button in the lower-right corner. You'll have to reboot for change to take effect. XP: Right-click an empty spot on the desktop and select Properties. Click the Settings tab, then the Advanced button. On the General tab, select the DPI setting pull-down menu. 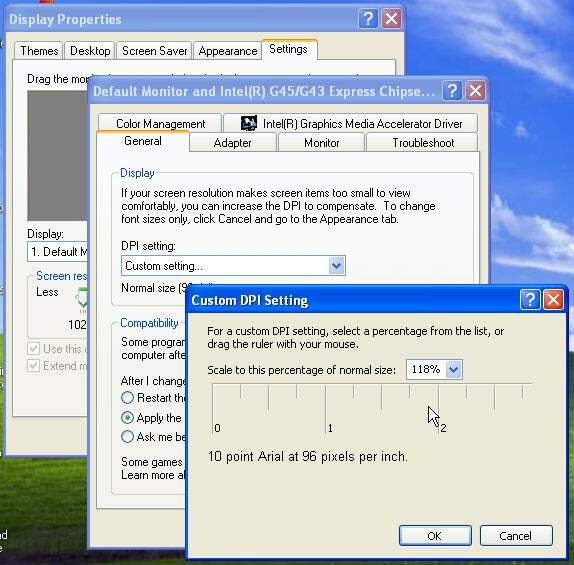 Select the 120 DPI option for a 25-percent increase, or click the Custom DPI button in the lower-right corner. XP has to look for fonts. Hopefully, you'll be told that it found them. If so, you won't have to insert your Windows disc when asked. While the change in Windows 7 and Vista effects everything on the screen, XP only changes fonts.